Your artwork in DPW can receive additional exposure by appearing on our What's New front page and in our Daily Email, which goes out to over 5,000 subscribers a day. It is the Front Page date for the work, set in either the Upload Wizard or in your Art Tracking grid that determines on which date your work will appear. For example, if you want to be on the front page and in the email tomorrow, then be sure one of your paintings has tomorrow as the Front Page date. The Front Page date is automatically set by DPW, but can be changed, as you will see below, in your Art Tracking grid. Important: A given work can be on the front page and in the daily email up to three times, however not more often than once every six months. Also, only one painting per artist can be on the front page and in the daily email at a time. So, if you have more than one painting with the same Front Page date, only one will be published. It is usually the first one posted for the day, but this is not guaranteed. So, the best strategy is to spread out your artwork's Front Page dates into the future, one artwork per day. When you are on the front page, you will get your day in the sun, up at the top, just under the featured artists. The art rotates upward every 5 minutes, making a full rotation every three hours. The Front Page date is set to the day of the pull. Keep in mind that DPW is pulling posts at midnight (central time) and so is pulling what was posted the day before. For example, if you posted a painting to your blog on Dec 6th, when DPW pulls at midnight Dec 7th, the pulled paintings will all have a Front Page date of Dec 7th and will be on that day's front page and out in the next daily email, which goes out each day at 4 am (central time). Note: It is a bit counter-intuitive, but keep in mind that while 11:59 pm is one day, that 12 am (midnight) is the next. If you pull or upload your painting before 4 am (central time), then the Front Page date is set to the day you pulled (central time) so your painting will go out in the next daily email at 4 am (central time). If you pull after the email is sent out, then the Front Page date is set to the next day. While this may all seem overly complicated, all that is happening here is DPW trying to make sure that, by default, any new paintings show up in the next daily email and on the front page for the same day they are in the email. 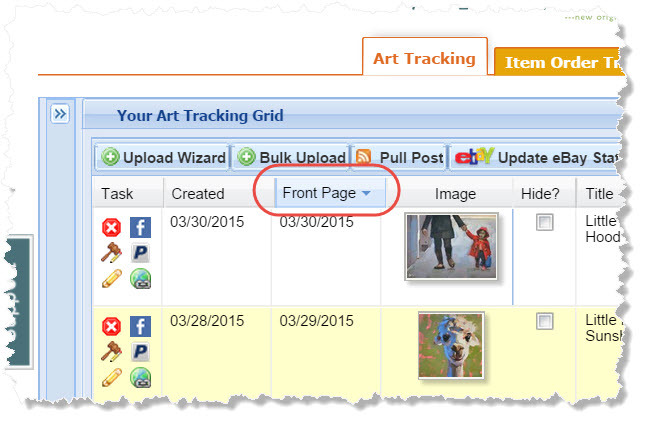 Even though DPW does set your dates, you are free to change these dates in your Art Tracking grid. Important: All we ask however, is you do not have a painting on the front page and in the email more than once. This is to ensure that these show only new and changing work to our buyers. Posted - Wed, Dec 7, 2011 at 1:53 PM. This article has been viewed 13553 times.